It is amazing to see the amount of gear scientists have to wear in order to work in caves. Cave scientists look like they are going to another planet when they get ready to study a cave. In order to go down into the deepest of caves a scientist puts on a lighted helmet, a mask, a special suit, carries a gas monitor and finally all of their equipment to study the cave itself. They need all of this stuff in order to protect themselves, otherwise they would become seriously ill or even die. Humans are not adapted to the extreme environment of caves. 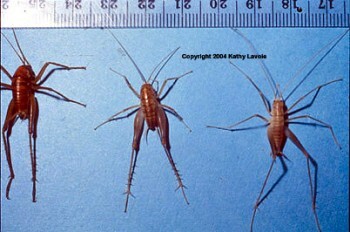 This picture shows crickets adapted to the cave habitat compared with some that are not so adapted. Animals are just like humans, they have to adapt or develop their own gear, in order to survive in caves. Seeing as how cave animals cannot go out and get special suits or a lighted helmet they must adapt physically. These adaptations occurred over many years and many generations, the children of the animals begin to become physically different in order to survive in the cave environment.